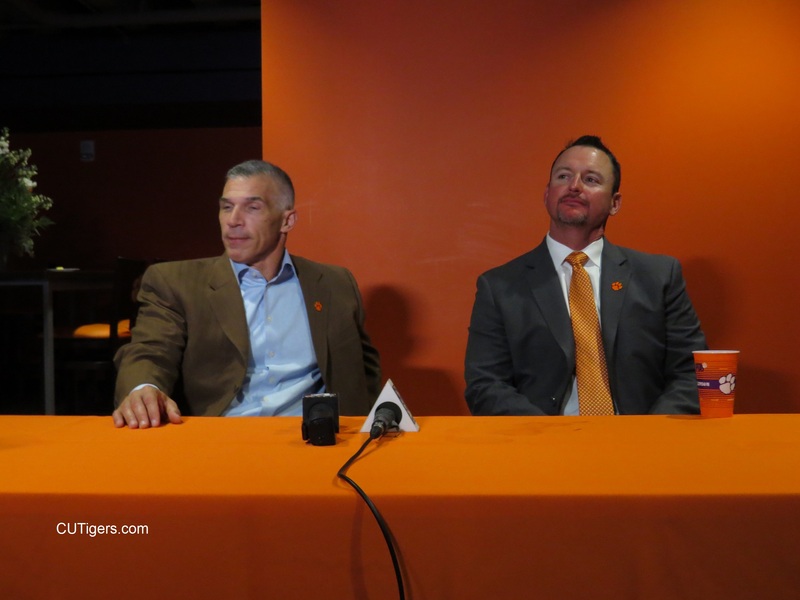 World Series Champion Joe Girardi was the keynote speaker at tonight's preseason baseball banquet, and a couple of us Clemson media guys were there to speak with Monte and Joe following the banquet. Joe is one of 3 men to win a World Series title as a player and manager with the Yankees (Ralph Houk, Billy Martin). He is a Northwestern grad and is a big fan of college football as well as Clemson. In fact, he met Dabo a couple years ago in New York. I asked him about catching for Clemson great Jimmy Key with the Yankees back in 1996, when they won the Series, and he told a great story about Key and Wade Boggs. I also asked him about catching for and coaching the great Mo Rivera, who was voted into the Hall of Fame last week and is the first-ever unanimous selection. I also asked Joe and Monte a few more questions, and I'll have the full video posted shortly!